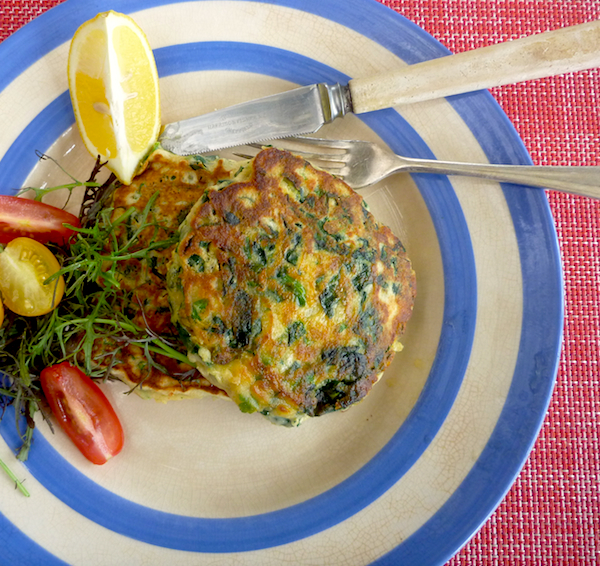 I love pancakes for breakfast but they never really feel that good for you, these pancakes from Ottolenghi’s book Plenty solve that dilemma by packing them with spinach and herbs. I’ve simplified the original recipe somewhat and serve them with a dob butter and a squeeze of lemon juice whereas Ottolenghi serves them with lime butter, which looks delicious, but I’ve never made it because it seems like way too much work for a Sunday brekkie. I also like my green pancakes with some maple syrup because I love sweet and savory combinations but that may be way too idiosyncratic a taste for most people. Remove stems from spinach and wilt leaves in pan with a splash of water. Drain leaves, let cool, squeeze out as much moisture as possible. Chop roughly. Put dry ingredients – flour, cumin, salt, baking powder, ground chilli in large mixing bowl and whisk together. Add egg yolks and milk whisk until smooth. 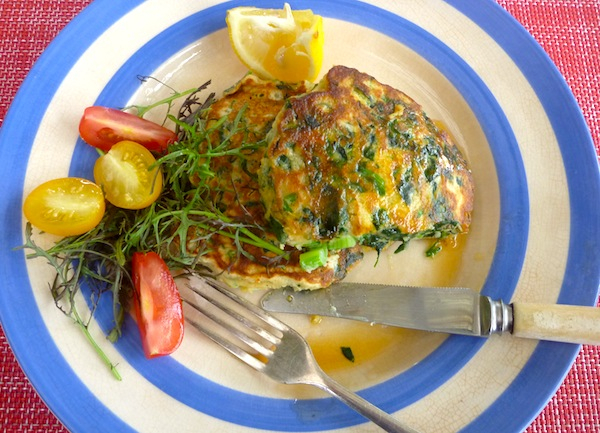 Mix in spinach, spring onions and fresh herbs if using. Whisk egg whites to soft peaks and gently fold through batter. Heat cast iron frying pan, grease pan with butter or olive oil and ladle about 1/4 of batter onto the pan cook until golden brown on both sides. Serve hot with a nob of butter and some maple syrup if you’re game.